Dark base lipstick is necessary to apply under dark glitters (black, brown, red, etc). 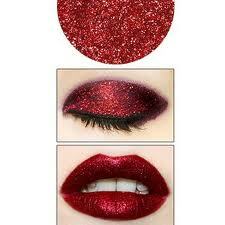 You will use less glitter, lessen the likely hood of flaking, and avoid having your lips or skin show through. You will see incredible results with more sparkle and shine! When using the Glitz glitters, use more liquid and less glitter and apply a sparse layer quickly across the lip. If glitter is “balling up” or flaking, apply a small amount of Glitz Fix to your brush and smooth out the liner.